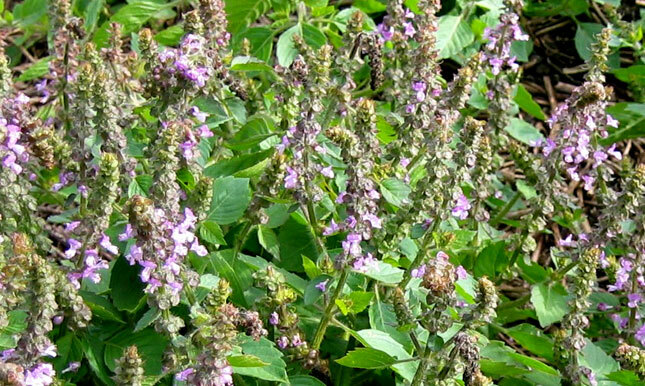 There are several cultivars of Tulsi that are grown in India, but only one that we can recommend for our northern climate. This variety has been grown in Oregon since 1983 as the 'old Abundant Life Seed strain,' and we have also heard it called Kapoor Tulsi. Either way, this is the only kind we can grow here. Eugenol, the signature scent and essential oil component of cloves (Syzygium aromaticum), is also produced by Holy Basil and contributes antimicrobial and antioxidant properties. We had a great Holy Basil crop last year, both for tea and for seed. We're getting better at direct seeding, having had success with both the broadcasting and raking method, as well as with sowing in 5 mm (3/16 in) furrows, which are then covered with soil and tamped to wait for rain. Rows spaced 30 cm (12 in) apart would be ideal, so we will go with the shallow furrows next year to maintain order and make weeding easier between the defined rows. We have given up on starting Holy Basil early in plug trays - though transplanting does work - and instead try to get the seed in the ground mid-May to catch a spring rain. Finding the zone between planting deep enough to retain good moisture and putting the seed too deep to get warmth and emerge easily takes some attention to detail, but is worth it. Two weeks after the rain there should be some germination evident. Holy Basil sprouts look a lot like Sweet Basil (O. basilicum) when they are young, but are somewhat more frost tolerant than Sweet Basil. Sprouts are tiny when they emerge and grow slowly, building root so they can survive the dry summer ahead. They don't do much in their first month, but then - just after they've been forgotten - they seem to kick in. They start to flower, at first slowly, with a few dainty purple blooms on one central spire, then erupting in waves of four additional flowering stems. Appreciative bees are steady visitors. We prefer to harvest at full flower, before seed has set on the lower blossoms, and were amazed at the regrowth over the season. Starting in mid-August we could have cut once a week until the September frosts - but we couldn't keep up. While considered an adaptogen, Holy Basil (as we know it) is not as strong a herb as Rhodiola, but still brews up a substantial and satisfying cup of tea. Triterpenes may support immune function, but it is the pleasing taste of the tea that keeps us coming back for more. Cut leaves are dehydrated. For tea, steep 1.5 grams (1 heaping teaspoon) of dried herb of the year per cup of boiled water for 8 minutes, strain and enjoy.Of course we had to leave our seed plants untouched to progress to dry seed heads. When the flowering spires turn from green to brown, pinch the capsules along the stem to check on the seed's progress. You can see the change from tan to dark reddish-brown to black as the tiny seed matures. We protected our main seed patch from light frost with blankets until a hard frost in late September had us harvesting all the plants and spreading the cut plants out in the barn to dry for a few weeks.